"A simple red wine sauce with brown sugar, garlic, paprika, salt, and pepper makes this dish simply yummy! 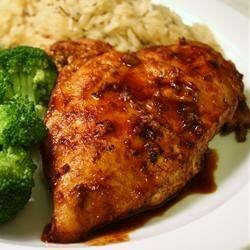 Braised chicken breasts, brazenly good taste." You can also use one whole chicken, cut up, for this dish, or 3 pounds of any chicken pieces you like.